Last edited by nc0gnet0; 01-29-2016 at 04:17 PM. Nice looking batch Rick. Good luck with your testing. Always good to see what strains you are working with and developing. Very nice Rick, it is great to see how they developed. Nice fish,looking for some discus to buy do you have anything for sale live in muskegon MI. Nice fish Rick as always. "No I am not sending you that video! Although cash is king!" 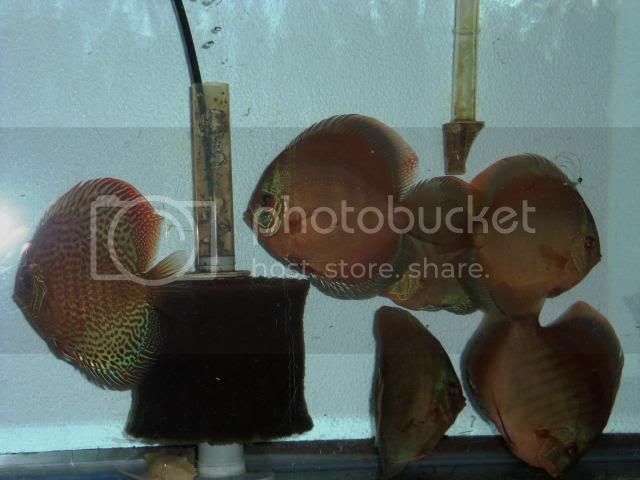 Yes I raised discus 5years ago just retired and want to get back into it .looking for a dozen 3,4in I really like ss,pigeon reds price depends on what you have.would even be interested in a young pair. Those fish look incredible. Great job with them. Out of curiosity, of all the batches, about how many did you get from each, start to finish, (eggs, hatch, wigglers, etc) and of those how many were losses to natural, culling, give/sell off and so on ? In the culling, was it specific deformities/oddities in them or that you were looking for a specific pattern/color variation of one over the other ? I did see that you wanted more browns to work with so were the offspring more carriers more from the mother or father side of the breeding ? As for losses, noe to really speak off, maybe a few belly sliders and an oddball death here or there at an early age. Only a few culls, again very minimal. sold most of the rest, except a few to work with of each. Last edited by nc0gnet0; 04-16-2014 at 12:44 AM. Yes that's the how many I was trying to ask. Sorry the combination of fat fingers/late night ( for me ) dirty readers and iPhone auto corrects. That sounds like a great mix to work with. For future reference, is this a project that you will continue to work with ? At this point in time I cannot take on anymore but hoping to move soon and looking for something rare.